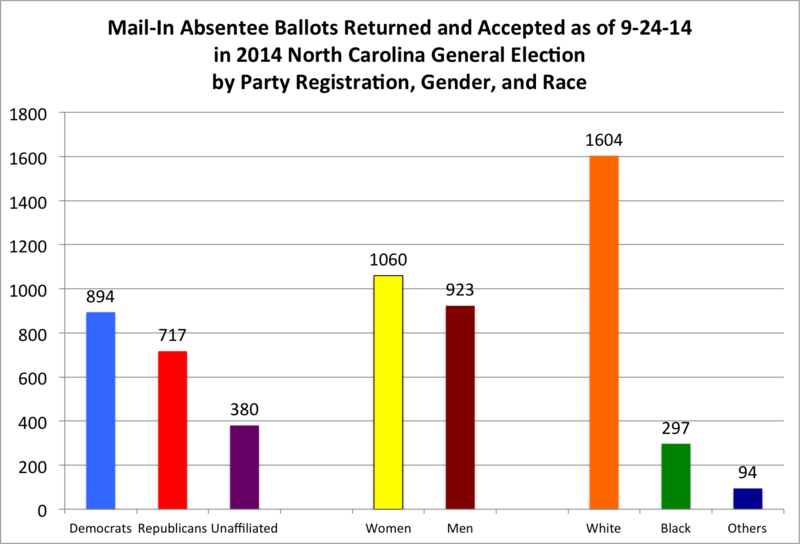 Today's datafile of mail-in absentee ballots in North Carolina shows an increase of 5 percent in requested ballots, up to 14,403, with a 23 percent increase in returned ballots to 1,995 ballots accepted, both from the previous day. Democrats continue to lead in requested ballots (41 percent of the total), with Republicans second (35 percent) and unaffiliated voters third (23 percent) and in accepted ballots returned (Democrats at 45 percent, GOP at 36 percent, and unaffiliated at 19 percent). 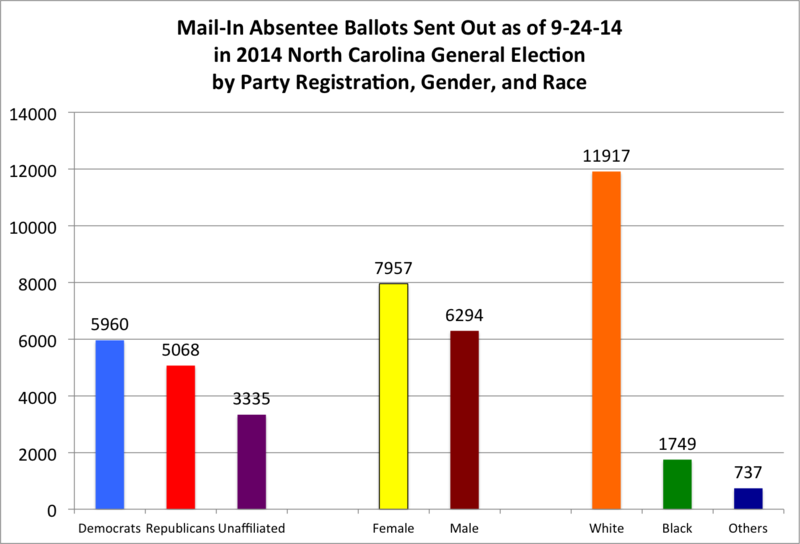 Women and white voters continue to lead in both gender and race in requested and returned/accepted ballots. One change that I have made since tracking these numbers: previously, in comparing this year's performance in mail-in ballots, I was comparing 'first day' of this year to 'first day' of 2010's election, and the numbers generally showed a lower performance this year in comparison to the 2010 election. Now, I'll be comparing "days out" from Election Day to garner a clearer comparison between the two elections (2010 and 2014). And what we find is a significant increase in all facets over the 2010 election results. For example, the first day of returned/accepted ballots in 2010 saw 23 ballots counted, which was also the forty-third day prior to the general election day. 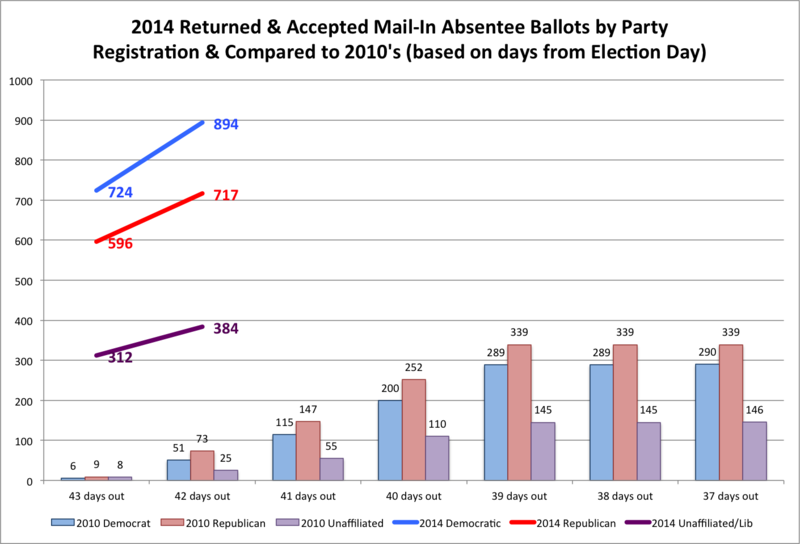 This year, due to ten days of counting returned and accepted ballots prior to the same "days before Election Day," we see a marked increase in the ballots counted on the forty-third day: 1,519 ballots, and that number has gone up with today's (September 24, with 42 days left before election day) data to 1,995 ballots. 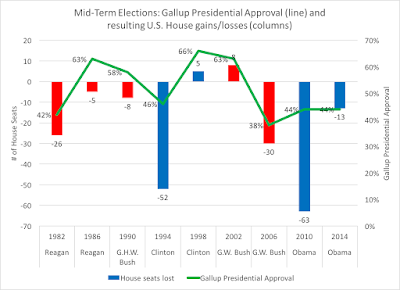 I believe this comparison approach is better to make "day-to-day" before Election Day comparisons of 2010 to this year's, and would certainly welcome any thoughts and ideas from others. 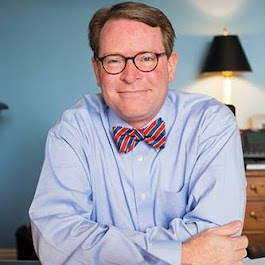 It is surprising, when viewed in this fashion, the strength of all three party registrations in terms of the numbers of ballots being returned, and the strength particularly of registered Democrats to lead in a traditionally-Republican method of voting. Whether this is a recognition by the voters of the decreased early in-person voting method or the energy/enthusiasm level if up, and most significantly up by Democrats, is something to continue to pay very close attention to in this highly-competitive election year.